Codeine is an opiate drug. It is most commonly used as a pain reliever and as a cough suppressant. Some people who abuse codeine can develop a dependence on the drug and may develop withdrawal symptoms if they try to stop using or reduce their intake. Do You Need Help With Codeine Detox? Who Answers? today to speak to a recovery support advisor about treatment programs for codeine withdrawal and addiction. Increased or decreased breathing rates. Anxiety (the anxiety may be severe and may result in panic attacks). Cravings to use the drug. Many people experience flu-like symptoms and may become dehydrated if they do not drink enough water. The amount of the drug the person typically used, the frequency of codeine use, and the overall length of time the person used the drug. People who take higher doses of codeine, take the drug frequently, and use it for long periods of time will usually have more severe and longer-lasting withdrawal effects. Whether or not the person abused codeine with other drugs. Mixing codeine with other drugs can result in a prolonged or otherwise complicated withdrawal syndrome. Individual differences. Differences in metabolism and psychological makeup can affect the withdrawal process. Going through withdrawal “cold turkey” will often result in more severe symptoms that may not last long, but can be extremely difficult to bear. On the other hand, a person who undergoes a monitored, medically assisted detox program may be in that program for a while, but the withdrawal experience may not be as severe as a result. They will also significantly reduce the potential for dangerous complications and the potential for relapse. A person can overdose if he or she relapses during or after withdrawal. Codeine withdrawal is not considered physically dangerous, though it is often very uncomfortable. Nonetheless, some people may become emotionally distraught or confused when they undergo withdraw. This may place them at risk for danger due to accidents, poor judgment, or even self-harm as a result of suicidal ideations. People who become extremely dehydrated are at risk for a number of potentially dangerous complications. Further, people who abuse codeine often abuse it with other drugs such as alcohol, other opioid drugs, benzodiazepines, and even stimulants. Regularly mixing codeine with other drugs can result in severe multi-drug dependence that can significantly complicate the withdrawal process. In addition, mixing codeine with other sedating drugs significantly increases the risk for overdose and death from respiratory arrest or severely slowed breathing. A person can also overdose if he or she relapses during or after withdrawal. When a person goes through withdrawal, his or her tolerance is lowered. If the person relapses on the same dose of codeine he or she was using before quitting, the person’s system may not be able to handle the amount of the drug, and the person can die from respiratory depression. Are You Addicted to Codeine? Who Answers? to get help finding a recovery program. You can receive treatment options based on your insurance. In general, the withdrawal timeline for codeine is as follows. 4 to 12 hours after last dose. People will begin to experience effects. The most notable symptoms are muscle aches, nausea, flu-like symptoms, runny nose, headache, diarrhea, insomnia, anxiety, and irritability. 1 to 3 days after last dose. Symptoms begin to peak. People may also crave the drug and may not have much of an appetite. But they should eat and remain hydrated. A person will usually experience withdrawal symptoms after he or she develops a physical dependence on codeine. A person who uses codeine for an extended period of time will usually develop tolerance. The person’s system becomes desensitized to the effects of the drug, resulting in that person requiring more of the drug to achieve the same effects he or she felt at lower doses. Tolerance to opioid drugs such as codeine develops rapidly. Withdrawal occurs after the person’s system essentially adjusts to daily functioning with a steady supply of codeine. This process of growing used to the artificial, chemical support of a substance such as codeine is known as physiologic drug dependence. When levels of codeine in a dependent person’s system decline, the system becomes imbalanced. The person then experiences a number of effects such as nausea, vomiting, headaches, and mood swings. The safest way to withdraw from codeine is to participate in a medically supervised detox program. These programs can be most comprehensively carried out on an inpatient basis. However, outpatient options are also available. However, simply engaging in a codeine detox program without any follow-up care leaves the person at an extremely high risk for relapse. After detox, people in recovery from codeine abuse will be urged to participate in a formal substance use disorder recovery program that includes counseling or psychotherapy. These programs teach stress management, help the person understand the reasons that drove substance use, and teach relapse prevention. People entering a substance abuse treatment program should receive a full physical and psychological assessment to identify any co-occurring disorders (dual diagnosis) or medical conditions. Residential or inpatient rehab. 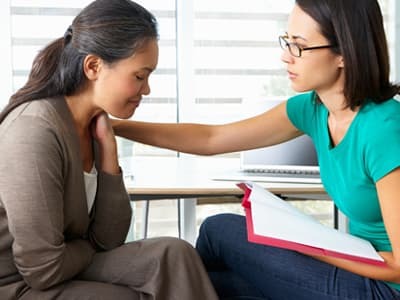 Inpatient programs often include a full suite of recovery services such as detox, medical care, one-on-one counseling, group therapy, and aftercare planning. These programs offer a distraction-free environment to focus on sobriety with addiction professionals and others in recovery. Detox center. A detox center offers medical care and support during the withdrawal process. Participants return home or transition to an inpatient or outpatient program after they finish detox. Outpatient rehab. Some outpatient programs may provide detox. Most include group therapy and possibly individual therapy. These programs do not require the person to live at the program and can offer flexible scheduling. Partial hospitalization program. Partial hospitalization programs are a form of outpatient treatment. However, they offer a more intensive level of care than other outpatient programs and require more of a time commitment. Participants receive medical monitoring, and some programs offer detox for people with mild withdrawal. People should also seek out social support from family members, therapists, 12-step groups such as Narcotics Anonymous, and peer action programs to raise money for community mental health centers or other proactive activities. Positive social support is a crucial aspect of recovery. Opioid replacement medications. Withdrawal management for opioid drugs may involve medications such as methadone or buprenorphine. These medications occupy the same receptor sites in the brain that opioid drugs occupy, and this gives the person a sensation similar to that of using the drug – but without the extreme highs and lows they experienced with their abused drug. The physician then slowly tapers down the dose over time. Eventually, when the minimal dose is reached, the physician discontinues use of the drug. Codeine tapering. In some cases, the physician may use a tapering program with codeine itself. Tapering allows the person to be weaned off codeine without significant withdrawal symptoms. Naltrexone. This drug helps to reduce the euphoric effects of codeine. It can be used to eliminate cravings for opioid drugs. Over-the-counter medications. Other medications may also be used depending on the specific situation. To get help for codeine abuse or withdrawal, call 1-888-319-2606 Who Answers? to speak with a recovery support specialist. You can receive treatment options and information about treatment centers based on your personal preferences. Forum Discussion: Is Codeine Addictive?
. Kane, B. M., & Triggle, D. J. (2007). Codeine. New York: Infobase Publishing.
. American Psychiatric Association. (2013). Diagnostic and statistical manual of mental disorders – fifth edition. Washington DC: Author.